The Gordon-Batman/Bruce Wayne dynamic is one of the most enduring elements of Batman’s mythology and lore. Often an ally, sometimes the character of James Gordon has also been an antagonist of sorts to the dark knight, although never a villain. In Zero Year, we’ve seen that there’s some bad blood between the two, mostly because of some unexplained event in their shared past for which Bruce detests Gordon very strongly. The previous issue actually gave us the reasons and laid it all out. But, that’s only one side of the conflict. 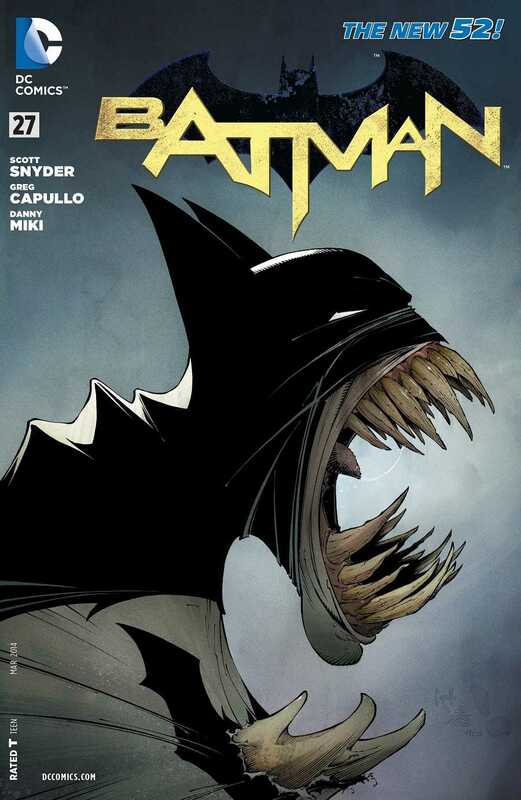 In Batman #27, Scott Snyder gives us Gordon’s version of those same events and where things went from there. In giving depth to Gordon as a character, Scott also ended up exposing the depths of the GCPD’s corruption and inadequacy as a law enforcement agency. And I loved it. It all fits in really neatly with the way that things are in the city, and it all makes sense. This is followed almost immediately by a long and involved conversation between Bruce and Alfred as the latter attempts to get at the heart of why Bruce has become Batman and why he does what it does. Given some of the previous conversations between the two, this is a reconciliatory gesture that brings the two closer together. And I think that it is time that we see something like this. Given the scope of the entire arc, we haven’t seen a lot of moments between the two, which makes this one all the more special. But at the same time, I have to say that this issue had almost too much dialogue. Cramming in all that dialogue in the panels causes the art to suffer since there isn’t all that much to see of the backgrounds. This is the biggest negative of this issue. Scott and Greg have done some great collaborations together when the dialogue is so thick on the surface, but for some reason, it was almost too much here. Perhaps because both Gordon and Alfred talk about their relationships with Bruce Wayne at length. Some of it could definitely have been trimmed down. At the same time though, the best part of this issue is the opening, where we see Batman go up against the GCPD, led by Commissioner Loeb. They have him cornered near the docks somewhere and they have an answer to almost all his moves and countermoves. It sets up a really great action sequence in which Batman actually does struggle, despite all his usual advantages, such as his training and his tools. It was a great way to start off this issue and also show that Batman isn’t as invincible as you might think. He takes quite a bit of a beating here. And as for the art, well, it was grand. The defining parts are the colours by FCO Plascencia. Greg’s pencils are great and Danny Miki’s inks are even more so, but I think that the big credit should go to FCO Plascencia for giving this issue, and the entire arc even, such a damn good vibrant feel. Each and every sequence is beautifully laid out and all the colours definitely counter the darkness of Batman and everything else that is associated with the character and with Gotham. Another sort-of negative thing about this issue is the ending, in which the Riddler makes a comeback. In keeping with Gordon and Alfred, he too gets a rather verbose outing here, but some of it feels distinctly boring. As if he’s just reciting a part rather than playing a part, if that makes sense. And I’ve very confused as to what Doctor Death and Riddler are doing together, so that’s another thing. Other than all that though, I definitely enjoyed this issue. More Batman: #1-10, #11-12, Annual #1, #13-15, #16-18, #19-21, Annual #2, #22-23, #23.1, #23.3, #23.4, #24, #25, #26. Posted on January 23, 2014, in Comics Reviews, Review Central and tagged Alfred, Batman, Bruce Wayne, Comics, Comics Review, Commissioner Gordon, Crime, Danny Miki, DC Comics, Doctor Death, Dr. Helfern, FCO Plascencia, Gotham, Greg Capullo, New 52, Police, Review, Review Central, Riddler, Scott Snyder, Steve Wands, Superheroes, Zero Year. Bookmark the permalink. 5 Comments.